At this Gorilla safari accommodation in Uganda, each individual chalet is raised on the hillside and connected to the lodge by wooden walkways. 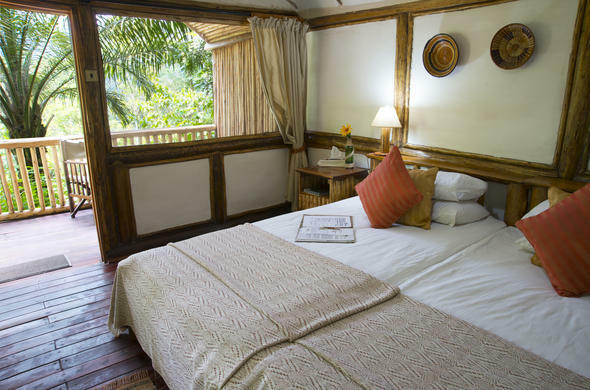 Buhoma Lodge has 8 comfortable and spacious cottages, each with its own private terrace, allowing wonderful views of the forest canopy of the National Park. This Gorilla safari accommodation in Uganda is carefully built to provide light and airy interiors with mosquito proofing. Each cottage has comfortable beds and a well appointed en-suite bathroom with flushing toilet and a hot shower - some rooms with bath tubs (there is a special treat in store for honeymooners). The central lounge at Buhoma Lodge is elevated and connected to the bar and dining facilities. Evenings are generally chilly and a homely fireplace adds warmth and atmosphere to the guest areas. The water supply at this Gorilla safari accommodation in Uganda is gravity fed and solar power is used for lighting. Power points are limited to a central area allocated for recharging cameras and videos. Guests enjoy sundowners by the fire before a delicious dinner. Meals are freshly prepared with many local ingredients and served in several courses.